Testing and UL Certification Documents Superior Performance vs Traditional Fluoropolymers. Rubadue Wire, of Greeley CO, has developed the first UL approved 300°C AWM (Appliance Wire Material) wire construction. The process development, material selection and final product testing were carried out through a close working relationship with DuPont engineers and Underwriters Laboratories. On January 29, 2014 Rubadue Wire was awarded UL certification, and a style page, for its new high-temperature single conductor appliance wire (AWM Style 11540) based on DuPont’s unique high performance fluoroplastic material, DuPont™ ECCtreme® ECA-3000. 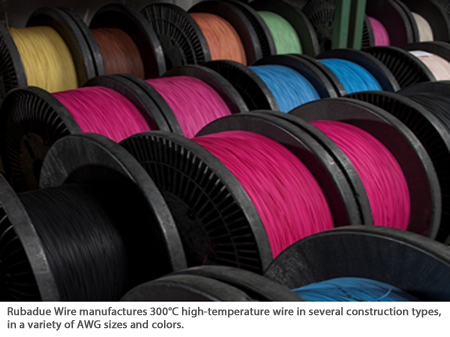 The Rubadue high-temperature wire product line is available in AWG sizes of 30AWG* – 8AWG, in a variety of standard colors. Rubadue Wire has invested in proprietary wire coating processes, specialized equipment, and technology to support the production of high-temperature fluoroplastic wire and cable. DuPont™ ECCtreme® is a new class of fluoroplastic resin (ECA). Wire produced with ECA (epitaxial co-crystalline alloy) exhibits the same beneficial properties of typical DuPont fluoroplastics with the additional capability to maintain operational performance under elevated temperatures, and harsh environmental conditions, for extended periods of time. The first of its kind, DuPont™ ECCtreme® ECA-3000 fluoroplastic resin is the material of choice for Rubadue’s high-temperature wire and cable product line. Rubadue Wire selected DuPont™ ECCtreme® fluoroplastic resin due to its unique and differentiating high performance characteristics. DuPont’s new ECA material has allowed Rubadue engineers to rewrite traditional fluoroplastic design boundaries to produce an extreme duty wire construction that was previously unattainable. In addition to higher operational performance, wire coated with ECA material, exhibits improved functionality when exposed to temperatures above 280°C. This is due in part to the material undergoing a thermal and structural transformation known as epitaxial co-crystallization. The result of this transformation is a lower MFR (as low as 1), a higher melting point and improved mechanical and thermal properties. *Rubadue Wire has UL certification for ECA wire AWG size to 30AWG, but can produce high-temperature ECA wire down to AWG38 for applications that may require smaller conductor sizes. **UL certification (E54681) lists DuPont ECA-3000 as having the highest Relative Thermal Index (RTI) of any melt processable plastic in the UL database. Rubadue Wire was founded in 1977 and has evolved into a full service global wire and cable supplier supporting a broad range of industries and end use applications. An ISO-9001 and ISO-14001 certified company.